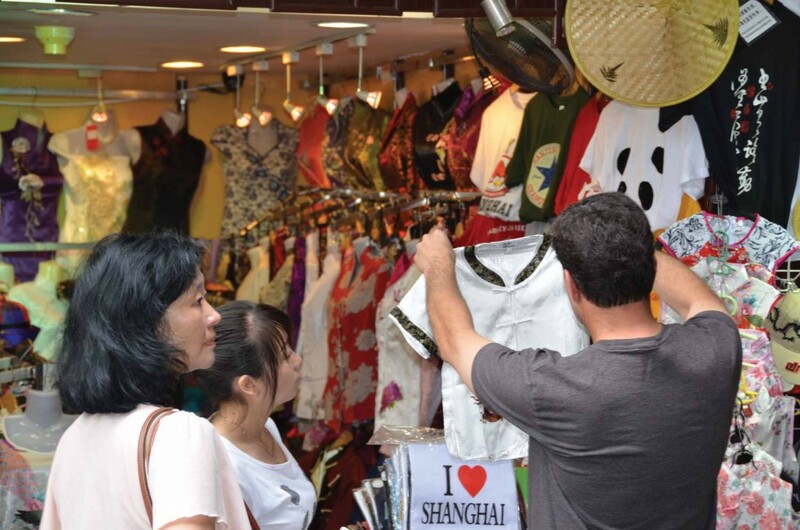 Ying Juan Rogers, executive vice president of World Trade Center Kentucky, and Mark Wilson with ECM Bioscience, sample the goods in a Shanghai market. World Trade Center Kentucky organizes trade missions to allow Kentucky businesses to explore foreign markets. Ninety-five percent of the planet’s 7 billion humans do not live in the United States, and only 1.4 percent of Americans live in Kentucky. Which makes the math clear: America and the commonwealth must export to maintain a satisfactory lifestyle in today’s global economy. U.S. multinational conglomerates derive an important percentage of their revenues from sales beyond U.S. borders. Thousands of Kentucky operations are steadily increasing their foreign business, too. State business and industry exported products valued at $10.7 billion in the first half of 2012, setting a pace that should exceed 2011’s record $20.1 billion. Kentucky’s top export categories by value are, in order: transportation equipment; chemicals; non-electrical machinery; computer and electronic parts; primary metal manufacturing; and appliances, components and electrical equipment. The transportation equipment category alone in the form of cars, trucks and their component parts was more than a third of the state’s total. Products and technical skills from Kentucky and the rest of the United States are vital needs in many foreign markets. And everybody has to eat: Countries in the tropics and most of Africa plus some of Asia cannot produce enough food on their own. Accessing foreign markets can be complex, but it is also quite doable. Foreign businesspeople have worked it out and are comfortable selling here – shoppers in Louisville or Middlesboro can commonly find basic perishables such as Guatemalan blackberries and Mexican blueberries at their local supermarkets. “It truly is a world economy at this point,” Thomas said. Export expertise among Kentucky business owners and management is steadily increasing. 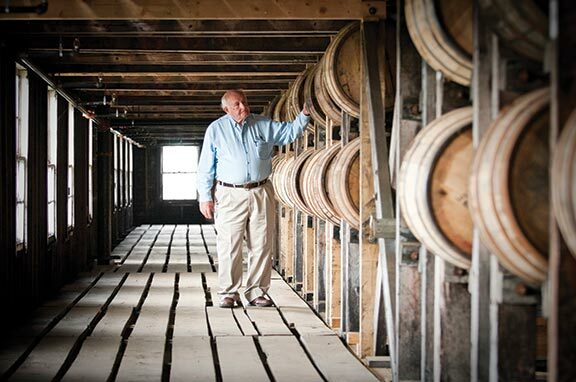 On a dollar basis, Kentucky’s export volume is growing about $1 billion a year, said Thomas. Measured by direct dollars, Kentucky’s ranks 19th among all states in exports, and on a per capita basis the commonwealth ranks 16th. More than 3,300 state operations were exporters in a 2008 count, of which about 2,500 were small or medium-size businesses. 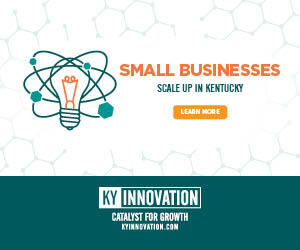 Growing exports is a prominent national and state economic goal, and there is much low-cost help available for Kentucky businesses seeking to export to foreign countries. The Kentucky Export Initiative was created to bring together various agencies and organizations that help facilitate international trade opportunities for commonwealth exporters. Technology, food, medical devices, pharmaceuticals, education, raw products, lawyers and other service providers can all be exported. So, how does a business become an exporter? 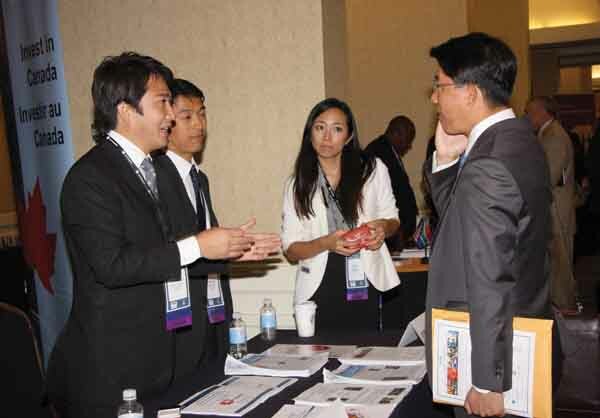 Tomonori Shibahara, left, director of business development for JETRO, the Japan External Trade Organization, speaks with the chief secretary to the Korean Embassy in Washington at Kentucky World Trade Day. JETRO promotes foreign investment into Japan and helps small- to medium-sized Japanese firms maximize their global export potential. The company had an exhibition at the World Trade Center Kentucky’s annual event in Lexington. The first decisions are deciding which markets to target and how to ensure payment, followed by pricing and how to transport your product. Naming is a vital ingredient: Don’t call your technology “No Va” in Spanish-speaking countries. Obtaining fluent dual linguists on your payroll is valuable, particularly those with expertise living in the regions where you want to market products. It’s vital today also to learn what the locals want from their perspective rather than treating them as if they were Americans living in another state. Indians have different desires than the Chinese, Japanese from Australians, Italians from Nigerians. What works well in one culture can flop in another. It’s useful to understand your customers’ traditions, mores and even climates. The emerging markets of Asia and many other countries are giving birth to a new middle class that desires a more luxurious life than subsistence work in factories and riding rickshaws – media images that might be familiar but outdated. 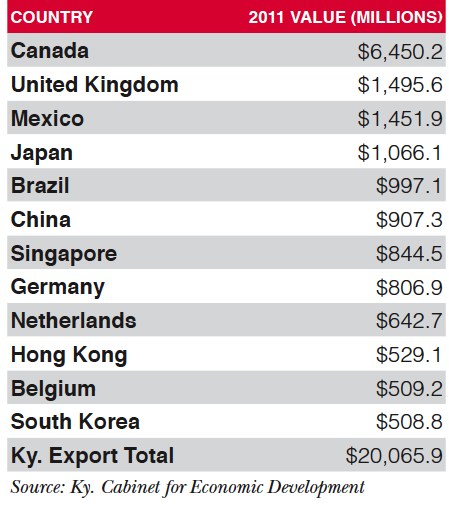 However, Kentucky’s top market is also the easiest: Canada buys nearly a third of all commonwealth exports. Most Canadians speak English, and product delivery is not much more difficult than driving north. “Many people think it is difficult, but our No. 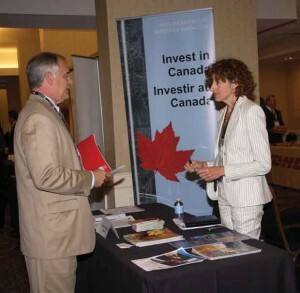 1 export destination is Canada,” Thomas said. Regulations there on U.S. goods coming from Kentucky and other states are very small. “The way you have to look at exporting is, it’s a way to stabilize your customer market,” he said. Likening the strategy to creating a broad U.S. sales base in more than one area, the goal should be to sell in as many places as possible to minimize exposure to regional ups and downs. Kentucky’s export business is expanding in some of global business’ far corners also, not just in the major markets. Through August of this year, the dollar volume of state exports was up 1,331 percent in Morocco, 600 percent in Bahrain, 427 percent in Latvia, 261 percent in Jordan, 212 percent in Kuwait, 99 percent in Luxembourg, 80 percent in Poland and 87 percent in Slovakia. How best to create export deals? Those interviewed for this article agreed that face-to-face meetings are the most satisfactory. 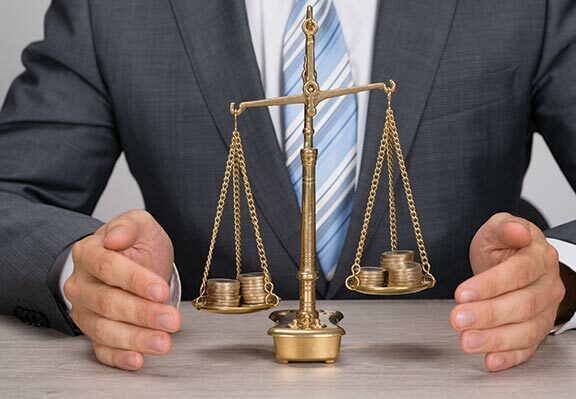 Most suggest fixing prices and trades in U.S. dollars, despite our currency’s weakness, and avoid currency hedging, which is suitable only for specialists. Likewise, barter might spark interest, but foreigners have more experience in that than Americans and are likely to gain advantage. Avoid becoming embroiled in messes caused by local, unpredictable currency fluctuations or local customs. What about basheesh, quid pro quo, kickbacks, “luck pennies,” protection, “insurance,” contributions and out and out corruption in international business? Protecting your deal with an unfamiliar party and keeping it clean requires the same skill set in New Jersey as in Mozambique or Beijing. Don’t expect all customers to be Florence Nightingale or Snow White. And you don’t have to sort it out alone. There is plenty of help available. World Trade Center Kentucky, with offices in Louisville and Lexington, has much experience and skilled executives who are willing to help you sell abroad. There are 300 WTC offices worldwide sharing local research, consulting, program training and seminars, said international trade specialist Ying Juan Rogers, executive vice president in the WTC’s Lexington office. Canadian Consulate General Anne Cascadden, trade commissioner, touted the benefits of trading with Canada during Kentucky World Trade Day in Lexington. The U.S. Department of Commerce and the Small Business Administration are helpful also, Rogers said. Nicholasville-based animal nutrition supplement producer Alltech has had great success. It has exported for 28 years and sells in 128 countries. It has built multiple manufacturing facilities around the world, obviously choosing its locations carefully. Hal Gervis, Alltech’s senior operations manager for Europe and Asia, and his colleague Matthew Carmichael, global logistics manager, recommend working with the WTC, researching and understanding your markets, knowing your competitors and developing a country screening and marketing research program. Gervis believes a good local contact/colleague/distributor/freight forwarder is essential. The WTC, local chambers of commerce and trade shows are helpful, he said. Both Gervis and Parker mentioned the estimated 34,000 trade associations within the United States that can supply valuable assistance. Gervis and others pointed out that developing countries are increasing their standards of living, some very quickly, and their improved diet, more disposable incomes and new desires for better goods are creating valuable markets to American producers. The WTC offers trade missions, which are better for most fledgling exporters to join than doinit yourself, flying solo and staying alone in a five-star Western hotel. Canada, England, Mexico, Japan, Brazil and China are Kentucky’s leading export markets, Rogers said, with chemicals and transportation equipment among the commonwealth’s biggest export earners. Some Latin America markets are difficult for exporters to sell to, she said. For example, Brazil has a protectionist, high tariff policy on many imports but is hungry for farm machinery. Coal mining equipment is in demand in China, where 70 percent of electricity is fueled by coal. As widely reported recently, billions of dollars worth of Kentucky coal is being exported to India. Rogers does recommend that exporters should work with experienced trade specialists, do detailed analyses of their planned markets, develop an export plan and attend trade shows overseas. Business consultants and freight forwarders are valuable partners for beginning exporters, said Larry Parker, a former manufacturer and engineer who set up manufacturing plants in Germany, Italy and Brazil and was involved with 270 factories worldwide. Parker offers help and advice to exporters and others through the Lexington office of SCORE, the Service Corps of Retired Executives. And recognize that there is plenty of government support and many incentives, including the National Export Initiative begun in 2010 as well as the KEI program. Some even suggest there is too much assistance. McClatchey newspapers, which include The Herald-Leader in Lexington, recently reported federal taxpayers subsidized a $500,000 export promotion campaign for the Chicago-based Popcorn Board that Congress created in 1996. Almost everything can be exported. One persistent rumor in Dubai insists an American company got rich exporting Florida sand to Dubai’s golf courses and beach. The WTC can advise on local regulations, statistical reports and watchdog agencies. It often receives calls from exporters after they’ve gotten into trouble that could have been avoided by consulting WTC or other experienced trade specialists beforehand. Rogers believes it’s very important for an exporter to deal with a good local lawyer, but not every expert agrees. Lawyers’ loyalty to local friends can be disguised, they warn. Many foreigners consider lawyers a primary reason for America’s economic malaise with their abundance of strange, unproductive lawsuits. They aren’t afraid of American lawyers. People cannot sue for injuries or accidents in New Zealand. In some countries, foreigners simply ignore any disagreement with Americans. Many foreign business people believe a correct contract should be four pages maximum; an increasing number believe long contracts are deal-breakers and they won’t sign one, especially if written by an American lawyer. How to get paid? 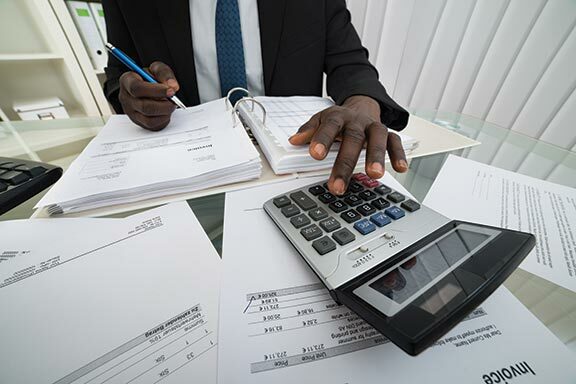 Most experts advise organizing letters of credit with an American bank experienced in foreign trade; expediting background checks and credit reports; and consulting with Dun & Bradstreet. Third parties can be hired for inspections. When selling to China, Rogers said, the standard payment program is that a client should pay at least 30 percent before exporters send their product, with the remainder paid promptly either on receipt or when it arrives in the Chinese port. What about those local regulations? Most foreign business people believe U.S. import, federal and local regulations are more complicated than their own. A cost-saving tip is that empty shipping containers returning to China offer cheaper transport for American exporters. Doug Rawnsley has 35 years experience in international trade, primarily in the Thoroughbred business. He’s lived in England, Ireland, Italy, New Zealand (for 15 years) and the United States and visited eight countries last year. He can be reached at [email protected].